Feeling like we were ready for a vacation after packing up the house, we left Charleston and started making our way north. As I'm sure most of you know, has been hotter than ****. That seems to be the case all over. Of course all that heat encourages thunderstorms and by noon we were seeing them pop up all over on radar. Finally - after a lightning strike that flashed simultaneously with the thunder clap - we decided to stop in McClellanville, a small fishing town. After learning that everything in town was closed on Mondays, we plugged in, turned on the a/c and skipped the sightseeing - which is limited on a good day! We delayed our morning departure because of morning storms in the area and decided on a short day's trip to Georgetown, SC. Along the way we'd heard someone on the radio talking about there being 30 alligators in the water. We never heard where they were, but we passed many along our way. There are at least six in this picture. We had heard that Georgetown was a nice stop and we weren't disappointed. After we arrived we took a walk down Front St. for a few blocks to the harbor walk that runs along the Sampit River. There are quite a few restaurants to choose from, but the Goat Island Grill seemed like our only choice. (For those who don't know, there is a running joke between Joe and his brother-in-law Neal about eating goat.) Sorry Neal, they don't serve goat - but we had a good dinner. The next day we took the Swamp Fox "trolley" tour and learned that Mel Gibson didn't win the revolutionary war single handedly. The tour took us down streets shaded by beautiful live oaks and lined with historic houses dating back to 1737. We saw the oldest, largest live oak in South Carolina - more than 500 years old and, at 123', taller than I ever thought live oaks would grow. Bethel AME, the first separate black church, provided one of the more interesting stories on the tour. One claim to fame is that Michelle Obama's grandparents were married there. In five generations the family went from slavery to the White House. More interesting to us though, was learning that the AME church originally had as a main purpose teaching the freed slaves to read so they'd be able to find work. Since they all had memorized hymns and bible passages, the teacher would turn to a memorized passage and point to the words as they recited them. We also toured the Rice Museum - if you go, the self guided tour and movie are probably as good as the guided tour. Our last tour was the Kaminski House. We had a wonderful docent on that one and what turned out to be a private tour. The furniture is the main feature, but the house is interesting also. Built in 1769, it was added to and extensively remodeled starting in 1946. So you have an 18th century house, filled with period furniture - and bathrooms (in various colors) for each bedroom. Joe's favorite part of the ICW is the Wacamaw River. The cypress trees are huge and osprey nests are plentiful. Just a beautiful, peaceful stretch of river. Next stop was Osprey Marina (Myrtle Beach area) with a four turtle welcoming committee. We stopped to visit with the Merillat's (Joe used to work with Chris), who took us to lunch, Costco and a grocery store (thanks!). This is a nice little marina with a good rate if you stay more than three days. We only spent one night and continued north, trying to time our departure to hit the Sunset Beach pontoon bridge at its hourly opening. We actually timed it pretty well, except the tide was too low and it couldn't open. We ended up dropping the anchor for the two hour wait along with a growing crowd. See that high bridge in the picture? Not done yet. It sits there teasing us. The ICW runs through Camp Lejune and you can often hear artillery blasts from the military training. As we came near we started hearing radio calls from "British warship." It was definitely a Brit on the radio and at one point one of the British helicoptors was ready to jump in to help US Coast Guard with a possible civilian rescue situation. Later, we saw this British landing craft along our route. 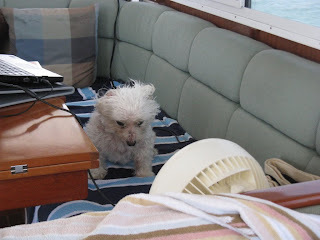 It continued to be way too hot and we stopped at marinas more than anchoring so we could us the power to air condition the boat at night. We don't run the a/c while we're running, so we had various fans set up. The dog cooling system consisted of a good spritzing with water followed by some fan time. We'd had the threats of storms, but little rain until the front finally came through. We'd stopped at Dowry Creek Marina near Belhaven, NC to wait it out. Nice marina, docks could use some work, but even with a courtesy car, there's not much to see. The promised front arrived with an incredible display of thunder and lightning. After the front passed through, we had some wonderful cruising weather. 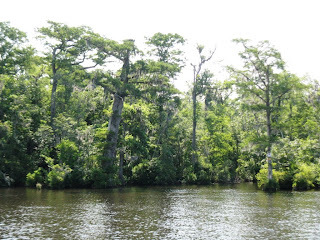 The next leg of the trip took us up the Alligator River and the Alligator-Pungo Canal. The landscape here goes from total kudzu coverage in some places to fields of sticks in others. At a distance it sometimes looks like lots of sailboats anchored in the distance. Joe always manages to spot a few bald eagles and there was also a deer swimming across the river ahead of us at one point. We had hoped to go to Edenton for the 4th of July weekend but found out that people book reservations six months ahead. With that option out, we headed for Elizabeth City's free dock with our fingers crossed hoping for a spot. We arrived on Thursday and there were only two other boats there so we settled into a slip and called my sister Jean who lives nearby. The next day Jean picked us up and took us to her house in Hertford. I got lots of laundry done and Jean fixed a great dinner. Rich opened one of his old bottles of wine - a 1979 . After candling it to remove sediment, he pronounced it nearly perfect and we all agreed. After dinner, we borrowed Rich's car and drove back to the boat. The docks in Elizabeth City have very short finger piers to use to get on and off the boat. In our case it means we have to climb over the boat railing to get to the pier. As Joe climbed over, the laundry bag shiftted, caught on a rod holder and dropped into the river. 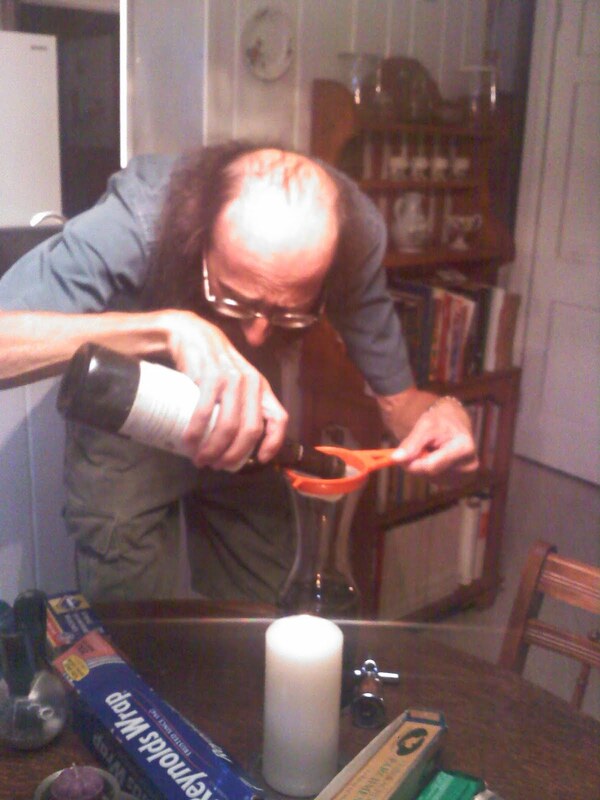 He was quick enough to retrieve it with a boat hook - but the next day we had to use Jean's washer and dryer again. That was okay because we were planning to go back to watch the Hertford fireworks anyway.